Lincolnshire welcomed Cheshire to Bourne CC to play their final two matches in the Unicorns T20 competition, both sides claiming a victory. In the first match Cheshire won the toss and elected to bat. Despite the loss of a wicket in the first over, opener Wayne White stood firm and held their innings together. With Cheshire on 77 for 4 in the 1oth over Nick Anderson joined White. Together they added 71 for the fifth wicket and took the visitors to a respectable total of 148 for 6 off their 20 overs, White top scoring with 61 with Anderson on 44 giving solid support. Lincolnshire started in positive fashion and, at 90 for 2 in the 11th over, were well on target to win. At this point Conrad Louth was dismissed for 32 and was immediately followed by Louis Kimber, who made 54 off 36 balls. This was the start of a disastrous spell when Lincolnshire lost five wickets for 13 runs, and only an unbroken seventh-wicket stand between Carl Wilson and Nick Keast took them within sight of Cheshire’s total, finishing on 140 for 6, Cheshire winning by eight runs. The second match saw Cheshire again win the toss and elect to bat. Again opener Wayne White held their innings together with 52 off 42 balls, being third dismissed with the total on 104. 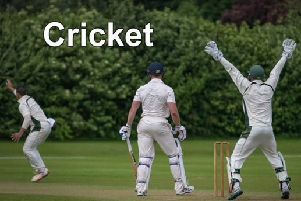 Middle order batsman Jamie Crawley continued to score freely and was on 64 not out going into the final over with Cheshire on 165 for 3. There then followed a remarkable period of play as Alex Willerton dismissed four batsmen in successive balls to leave the visitors on 165 for 7 after 20 overs, Willerton finishing with 5 for 28 off his four overs. Lincolnshire set about their task from the first ball as Conrad Louth and Louis Kimber dispatched the Cheshire bowling to all parts of the ground. With the total on 73 Louth was dismissed for 34 off 15 balls and Kimber was then joined by Bilal Shafayat. Lincolnshire were not going to make the mistake they made in the earlier match, and these two saw off the Cheshire bowling with ones and twos and the occasional boundary. With the scores level, Shafayat was out for 50 off 36 balls. Lincolnshire won by eight wickets in the 16th over with Kimber again showing his class with a fine 73 not out from 42 balls (six fours and four sixes).